Cuba has an area of 110,860 square kilometers. Cuba is a suitable destination for all seasons. The high season is from December / March. The Cubans have vacation in July and August. This characteristic way of living still occurs in rural Cuba. They are rectangular huts with walls of wood, rammed earth floors and roofs with palm leaves. 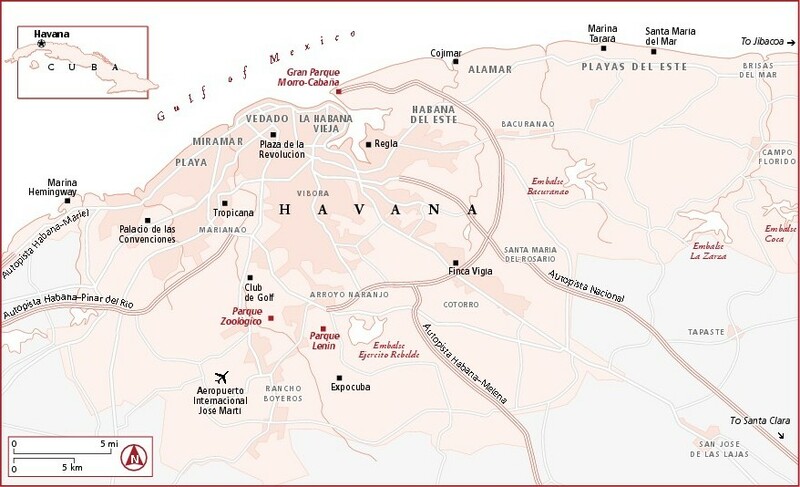 The capital of Cuba is Havana / La Habana. There are many casas particulares at Cuba; a sort of bed and breakfast pension, often these are fairly cheap and it's a nice opportunity to get acquainted with the people of Cuba. One of the most famous cocktails, consisting of white rum, cola and lime juice. The Cuban cuisine has many dishes with beans, rice and pork. A real Cuban meal is congri arroz (rice with beans). Outside the major cities, there are few restaurants. Butl there are many paladares, specialty restaurants, with permission, by Cubans at home. Here you can get very good and affordable food. However, it is advisable to ask in advance what the menu is and to agree on a price. AA particular quality Paladar is La Guarida 'in Havana. Here is the famous Cuban film "Fresa y Chocolate" recorded. It is wise to book in advance. Cycling at Cuba is going fine; there is hardly any traffic, while roads are still everywhere well maintained. With the cycling Lonely Planet you can find your way easily. The signage on the main road is minimal. There are in Cuba no paths. You may cycle in Cuba on the highway. The people are very friendly and always willing to have a chat if you speak some Spanish. Bicycles can also join taxis for shorter distances. Spare parts are hardly get in Cuba, it is therefore useful to bring your own. Health care and education are excellent developed in Cuba. 80% of the farms are in the hands of the State. The main Agricultural Product is sugarcane. Manufacturing (textile, leather shoes, tobacco) provides 46% of GDP. Major exports are tobacco and nickel. Tourism is now the second largest source of foreign exchange. The electricity at Cuba is 110 or 220 volts. In many cases, you will need an adapter. Sockets have round or rectangular holes and can be grounded or ungrounded. In Cuba live many different animal species. A rare species in Cuba is the Cuban insectivore. Furthermore there is the wild boar and deer. The marshes are inhabited by crocodiles, including the endangered Cuban crocodile. There are in Cuba more than 370 bird species. The national bird is the Cuban trogon (Priotelus temnurus), better known as tocororo to the sound it produces. Its colors, red, white and blue are the same as those of the Cuban flag. Cuba has 15 national parks. In the distant past, Cuba was almost entirely covered with tropical rainforest. Less than 10% of the initial forest remained and people are constantly working on reforestation, with fast-growing species. A piece of (almost) rainforest can still be seen in the Sierra Escambray mountains. In total there are growing almost 8000 different species of mosses, flowers, plants, shrubs and trees. The royal palm (Roystonea regia), is the national tree of Cuba, it is therefore protected. The national flower of Cuba is the butterfly jasmine (mariposa), a white butterfly flower. The formal name of Cuba is the Republic of Cuba (República de Cuba). Cuba consists of the island of Cuba, the Isla de la Juventud and 4,000 smaller islands. Cuba is bounded on the north by the Gulf of Mexico and the Atlantic Ocean, to the east by the Windward Passage, in the south by the Caribbean Sea and to the west by the Yucatán Channel. Cuba is a Caribbean melting pot with colonial architecture, hospitality, cigars, rum and salsa. Cuba consists of 4,195 islands, the largest is the main island of Cuba, the Isla de Juventud and numerous smaller islands, the largest island Cuba is flat, in the south is a mountain range, the Sierra Maestra. The Pico Turquino is the highest mountain on the island with a height of 1974 meters. Cuba's coastline is about 6000 kilometers long and ranges from swamps and mangrove forests to cliffs and beaches. The longest river is the Rio Cauto (370 km) in the province of Granma. The most water-rich river is the Rio Toa in Guantánamo. Cuba measures from east to west about 1250 kilometers. From north to south the widest part is almost 200 kilometers and the narrowest less than forty miles. Cuba has 11,061,886 (2013) inhabitants. Mmore than fifty percent of the Cuban population is younger than thirty. The rich history of the Cuban population is a melting pot of various influences. Mulattos ('mestizos' in the vernacular), Afro-Cubans, whites and Chinese are the main populations. Broadband internet is hardly available in Cuba. In large cities there are many cyber cafes. Some hotels offer Internet access. In Cuba there are two valid payment systems, namely the Cuban Convertible Peso (CUC) and Cuban Peso (CUP). For tourists the Convertible Peso is the preferred payment method because all tourist services only accept this money. In circulation are bills of one, three, five, ten, twenty and fifty Cuban Convertible Peso. This green / orange / red bills are clearly identified. The Cuban Convertible Peso back can be changed at banks at the airports in Euro (current exchange rate). For credit card payments no Cuban Convertible Peso is used, the currency is US Dollars. In the big cities, such as Varadero, Guardalavaca, Holguin, Santiago de Cuba and Havana, are the branches of large international banks. Cuba has a tropical climate, so there is hardly any difference between winter and summer temperatures. The dry season is in winter from November to April. The wet season is in the summer from May to October. The hurricane season runs from August til October.